Chilly isn't it? We received quite a bit of showers today accompanied by gusty winds. mainly fair skies across the islands for the next few days. showers will also take place. I hate to remind us, but the Hurricane Season is once again approaching. So the earlier we start preparing the better. Have a great night and be safe. Our evening was filled with heavy rainfall, wind, blinding lightning, and just a little rumbling of thunder. The night wasn't too bad occasional downpours and lots of wind. Valid up to 8 am tomorrow Thursday 13th December 2007. Winds: E at 14-22kts with higher gusts at times..
Seas: Rough with waves/swells 2.1-2.7m or 7-9ft. A small craft warning is in effect. Our skies today are overcast with regular showers. All eyes are now on Invest 94. Will it become a named tropical/subtropical storm? Where is it going? The experts may have answers accordingly. so keep alert! - Longest, and probably the strongest earthquake I've felt years! At about 3:00am I was at work at one of the stores on Port Zante talking to my mother on the telephone. A few minutes into our conversation my mother started yelling... "Earthquake!!!" I was like... "what?" The mirrors on the counters, and the jewellery hanging on the walls were shaking, I couldn't believe what was going on. Everyone on Port Zante ran out of their stores and were just standing outside looking around in amazement as the ground shook. Cable and Wireless cellphones had no service for a few minutes after the earthquake. This is definitely the longest and probably the strongest earthquake I've felt in years! Felt the ground shaking in the house about half an hour ago - check online and looks like a 7.3 down near Martinique. I hope nobody was hurt. For us it was just about 30 seconds of the floor moving in a way it shouldn't, with the table shaking a bit in response, and our mirror on the way swinging a bit. No damage around the house. - Ash, sulphur and lots of heat. If you were wondering why the place looked like there was a fire and there was a foul scent in the air on Wednesday and Thursday, it was ash and sulphur from the nearby Soufriere Hills, on the island of Monsterrat. For ash advisories and updates on the volcano, please go to these sites: http://mvo.ms/ and http://www.ssd.noaa.gov/VAAC/messages.html. Otherwise, the days are extremely hot and dry, with cooler evenings and early morning showers. First I would like to apologize for being unable to give you my regular updates, but I've been sick. The weather here has been good! We had a few rainy nights and mornings but nothing too bad. Most days like today started with the regular a.m. showers, but clear and warm during the day. Today we were blessed with the docking of Queen Mary2. Quite a nice shopping day for the tourists: a little breeze, nice sunshine, the skies were actually mostly clear with only a few fluffy clouds here and there. Temperatures were in the upper 80s and the only rain fell in the early morning hours. It is now approaching the end of the Hurricane Season, but is it really the end? Will we get another named storm before the season officially end? We had quite a few hurricanes to remember, Noel being the last, though we only received a few downpours of rain and wind from it's backside when it was not quite a storm. Looking at the Atlantic, there's still little clusters. Let's pray that's the end so our tourism season can begin and continue very successful! We received great showers late last night through this morning. 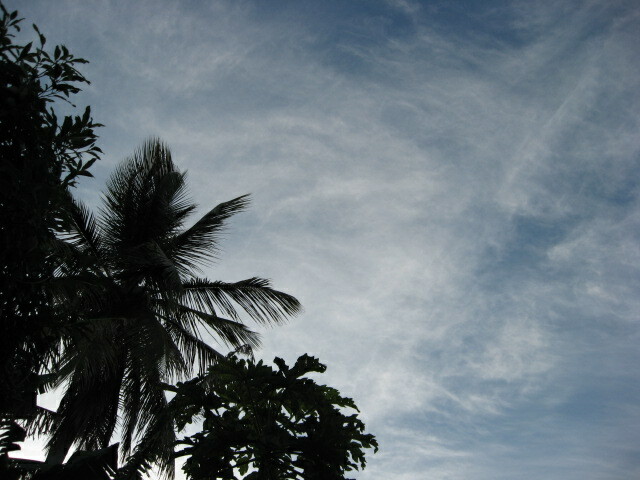 The weather is presently warm and cloudy. Valid up to 8 am tomorrow Monday 22nd October 2007.
a slight chance of a few thunderstorms after midnight. Winds: ENE to ESE at 10 to 16kts today and 5 to 12kts tonight, both over land and open waters. Seas: Moderate with waves of 1.2 to 1.5m or 4 to 5ft.. According to the satellite, looks like we are in for an overcast weekend. We are presently receiving light showers with a little rumbling of thunder in the distance. The main ghauts in Basseterre are already running vibrantly. Please be careful drivers and pedestrians alike. Here is the forecast for today and tomorrow. Overcast with rain showers at times. High 84F. Winds SSE at 5 to 10 mph. Chance of rain 40%. Cloudy with occasional rain showers. Low 78F. Winds SE at 5 to 10 mph. Chance of rain 40%. Partly to mostly cloudy skies with a few showers possible. High near 85F. Winds SE at 5 to 10 mph. Chance of rain 30%. Partly to mostly cloudy with scattered showers. Low 79F. Winds SE at 5 to 10 mph. Chance of rain 30%. - Lightning and Thunder Show. The Caribbean Sea resembled a large placid lake this morning. The sky was mostly cloudy with a few occasional showers. Temperatures were still within the mid to upper 80s while the Sun attempted to poke her head out as often as she could. This afternoon though, the heavens grew wickedly dark. As the evening settled in so did the lightning and thunder show. The lightning was the star of the show, but the thunder had some real serious solo pieces. There was a few welcoming showers, hope it's enough to keep down the heat tonight. It was warm, and somewhat uncomfortable, ... then it RAINED! We really really needed it to beat some of the heat. Some folks grumbled, but guess what? We wouldn't have beautiful, lush, green vegetation if there was no rain. Atlantic... hmmm. Karen is taking her predicted path. Let's hope she keeps it that way. Doug said it all so I will just give you an idea of what is forecast for the island today and tomorrow. Also there's yet another cluster just off the African coastline. Very low, but again it's worth monitoring. Rain showers early with scattered thunderstorms arriving by the afternoon. High near 85F. Winds SE at 10 to 20 mph. Chance of rain 50%. 1 to 2 inches of rain expected. Cloudy with showers. Low 79F. Winds SE at 10 to 20 mph. Chance of rain 50%. Rainfall near 2 inches. Showers early then scattered thunderstorms developing later in the day. High 86F. Winds ESE at 10 to 20 mph. Chance of rain 50%. Rainfall over 2 inches expected. Variable clouds with scattered showers. Low around 80F. Winds E at 10 to 20 mph. Chance of rain 30%. Lots of rain around the island last night and today. This morning I'm starting to hear thunder occasionally - and just not a pretty loud one, sounded close. The satellite looks like we'll be getting a bit more rain probably thunder and lightning the rest of the day. I'm starting to keep an eye on tropical storm Karen, although it's still far out east of us, and looks like it'll turn north well before threatening any of the islands nearby. I turned on my laptop this morning and the burst of activities were most shocking. Our forecasts for the next few days have changed quite a bit, from showers and scattered showers, to thunderstorms as Invest 97 which was located at 11.4 55.0W makes its way West at around 12mph. There's also Invest 96 that is worth keeping an eye on. We have received showers and scattered showers from late yesterday afternoon through this morning. Temperatures are still streaming in the upper 80s. Variable clouds with scattered showers. High 86F. Winds SE at 5 to 10 mph. Chance of rain 30%. Partly to mostly cloudy skies with a few showers possible. Low around 80F. Winds SE at 5 to 10 mph. Chance of rain 30%. Variable clouds with scattered showers in the morning, then thunderstorms in the afternoon. High 87F. Winds ESE at 10 to 15 mph. Chance of rain 40%. Showers and scattered thunderstorms. Low near 80F. Winds ESE at 10 to 15 mph. Chance of rain 60%. To all you Kittitians here, there... Happy 24th Independence! Lots of thunder and lightning activity going on around us for the past 2 days. Occasional brief showers and extremely hot temperatures, so those of you who love the beach, today was a great opportunity to enjoy the water. So Ingrid, depression as she may be, decided not to go where she was forecast. At 11am, she was located at 17.2N 57.9W moving towards the West at 11mph. Her winds are at 35mph with higher gusts at 45mph. Is she going to still turn North? Or is she is going to greet us with whatever she has to offer. Our northern islands have to keep our eyes on her and prepare for whatever. In the mid Atlantic there's another interesting blob. Let's keep an eye on that as well. Locally it is miserably hot and uncomfortably still. Just a few clouds floating about. The Atlantic looks very busy right now. Thunderstorms, showers and even possible formation of yet another name storm. Let's keep our eyes open! Today was forecast for rain and possible thunderstorm, as a tropical wave makes it's way west-northwestwards through the Lesser Antilles. It was very cloudy, lovely cool breeze, but very few droplets. Thunder was heard very close by as well. We do need a little rain, as the heat has been merciless for the past few days. Watching Felix is like watching a horror story with a serious suspense. For those of you in this monster's path, my prayers are with you. This is the peak of the hurricane season. Little clusters continue to roll off the coast of Africa. Please be prepared for whatever comes our way. Several little systems floating around in the Atlantic area - Invest 96L way up off the east coast of the US, and Invest 94L down east of the Windward Islands. Just this morning the NHC issued a special tropical disturbance statement about 94L - indicating it may be forming into a tropical depression. They're sending a recon aircraft to take a better look at it. The models suggest it may become a tropical storm in the next couple days. It's staying pretty far south, and it looks like it'll head straight for Mexico. ... That's what the older folks here like to say, when we receive weather like this morning. It was cool, dark and rainy with a nice thunderstorm. Lots of umbrellas were out heading to work in the rain. The ghauts were running a little lively and muddy. It's now warming up. The sun is sticking her little head out now, but a few dirty grey clouds are still present over in the Caribbean Sea and over the hills. After my update this morning, the weather changed. Rain stopped for a few hours, and the sun peered through the clouds. Most stores and businesses opened. The day seemed very normal. At just about 11am, the sky grew a dirty grey, the wind picked up and the rain started falling. At 5:00pm we were still under tropical storm warning. This may be discontinued later tonight. It is raining with winds of around 26mph, and gusts at around 39mph. Temperature now approx. 79degree F.
We are presently experiencing winds at just around 28mph. The sky is overcast, with occasional brief showers. I am hearing sad reports from out of Martinique and St. Lucia over the radio. Our prayers are with you. At 11:00am, our advisory has been upgraded from a tropical storm watch to a tropical strom warning. 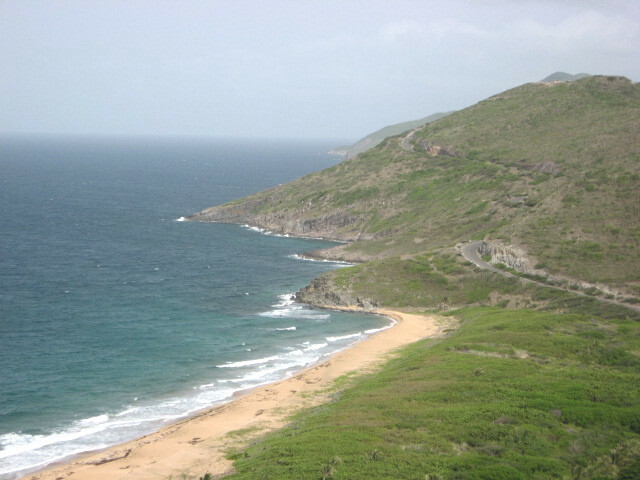 This also goes for neighbouring islands Nevis, Montserrat, and Antigua and Barbuda as well as St. Eustatius, Saba and St. Maarten. The now 90mph Dean can still take a turn northward as it quickly reaches what seem to be the edge of the ridge holding it down. So please be ready for whatever comes our way. It is currently a little breezy, partly cloudy with temps of approx. 88F. - It's getting quite active isn't it? Well I am a little relieved that Mr. Dean may be passing more south. I am still keeping my eyes on it though, 'cause these systems tend to have a mind of their own. There are more waves jumping off the coast of Africa, so regardless, we should all prepare ourselves for anything that may come our way. The morning was very warm, but through the afternoon we received several showers. Quite refreshing :). Let's pray for the islands that will encounter Tropical Storm Dean. Tropical Storm Dean looks like it will likely develop into a hurricane by the time it enters the Eastern Caribbean - likely before passing north of Barbados, if the current models are to be believed. The predictions for this weekend have it passing well south of us, but we're getting prepared anyways, just in case it decides to take a turn to the north and head our way. Either way we expect rain and some wind Friday night and Saturday morning. Hope everyone is ready! Beautiful lightning display this evening over the Caribbean Sea. I sat quietly for a little just admiring it. 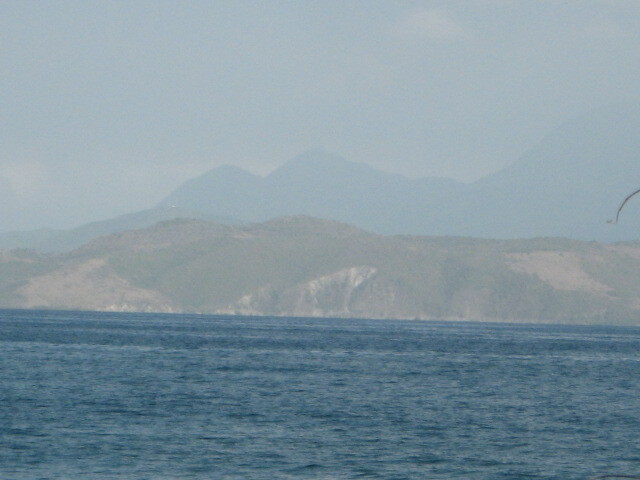 I realize some of our islands eg. Jamaica, Hispaniola, Puerto Rico are receiving some nasty weather. Other areas are a little dry, but don't give up on that rain yet. There's a few waves hanging around. Hurricanes? No, not yet... but that Blob as Dave calls it looks mean. Let's keep an eye on this one. It was another beautiful day in Sugar City. The day was hazy, little breezy, quite dry and hot! Though it's off season, I saw quite a bit of tourists shopping around for souvenirs and a few locals have started their back-to-school shopping already. Yesterday we received light showers on and off throughout the day. The sky was mostly cloudy, temperatures still warm, but just a bit cooler than the days before. Today is pretty much normal. It's warm, sunny, a little breezy with quite a bit of cloud cover. No sign of rain... yet. It's been very hot over here for the past few days. Very breezy though. This afternoon at around 4pm, as I was playing inside with my angel, I heard the rumbling of thunder. I was a little surprised because of the heat and the sunshine, but as I glanced over at the ocean and up at the hills, I realized that the place had darkened quite a bit. Not much rain though, but constant lightning and occasional thunder, especially over in the Caribbean Sea. I don't mind a little rain though. Just enough to cool off the heat. 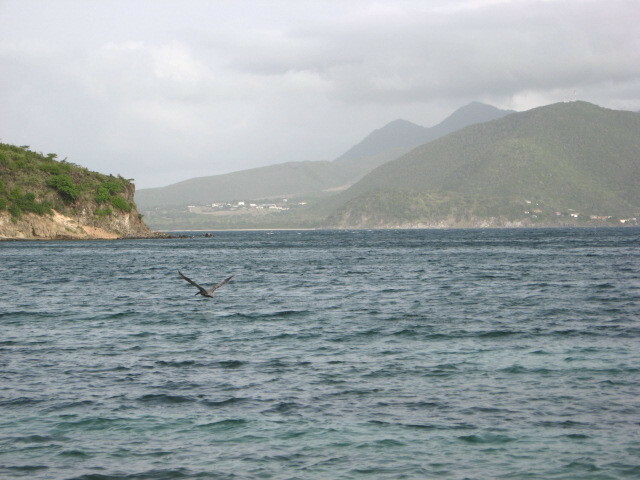 For those of you celebrating carnival, namely Antigua and our sister island Nevis - Enjoy the holidays and be safe! ... Very windy here in Sugar City, St.Kitts, as the large "blob", (as Dave calls it), passes south of us. Winds E at 20-30mph. Variable clouds with occasional sprinkle of rain. Let's keep our eyes on the Atlantic though. Things are beginning to heat up! Well I am happy to report that between the little clusters of clouds, there's blue skies :-) Perhaps now my sinuses will calm down some now the SAL has dissipated . Temperature is in the upper 80s with very little wind. It's a pleasant day to enjoy the beach. Most of the weekend was steamy. Refreshing rainfall during the a.m. hours. - Back to the Heat and Haze?! There's not much going on here right now. It's very hazy, little wind and oh... scorching HOTTT! With this heat, the wind is not very noticable. 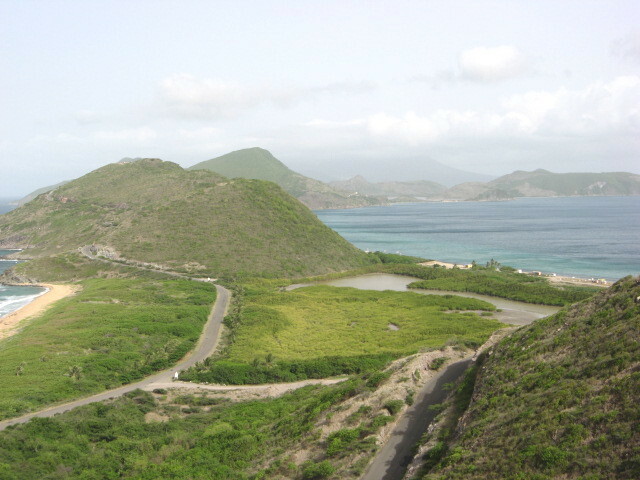 I haven't heard much complaints about St.Kitts being too hot lately, as we are blessed with daily showers. The evenings also are much cooler as the rain tends to fall during the evenings and a.m hours. Temperatures are within the mid 80s, (High 87 and Low 80) with a nice cooling breeze. 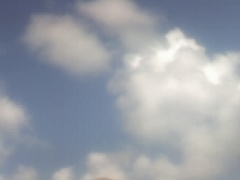 The sky here in Basseterre is partially cloudy... no rain though. Well the forecast was correct! From around 5:00pm, as I was getting ready to leave work, the sky once again grew stormy. Thick grey clouds speedily covered the sky. Lightning appeared over the Caribbean Sea, and the rumbling of thunder seemed to surround the island. Within minutes it was pouring, with the lightning and thunder becoming more constant. This lasted throughout the evening and into the a.m. hours. Today is very different. It is hazy and cloudy, very warm with no evidence of rainfall. - Huff... Puff... and away! I thought we were going to get it real bad this morning. The sky turned a dirty grey, the chilly wind grew wild, blasting the trees and anythingelse in its way. The rain pounded the roofs and the streets. Bits of thunder had my poor dog running between my legs as I got ready for work. Yes my people, it was a crazy morning! It didn't last too long though, just a few hours. It appears that rain is falling in the hills, but nothing here in Basseterre now. Just cloudy skies and the sun forcing its little head out ever so often. It's beginning to warm up a bit also. Forecast says to expect a little rain and perhaps thunderstorms this evening, so let's see what happens. - Hi and Bye wave! The morning grew dark at just about 10:30am. The wind picked up, blowing the tree branches fiercely towards the west. The skies opened into a nice downpour with intermittant thunder. The downpour didn't last that long though, it sprinkled into the afternoon and evening at occasional intervals. The air got nice and chilly, great change from the uncomfortable heat. Today is mostly cloudy with temperatures in the mid to upper 80s. Still windy, coming from the east at about 15-25mph. Rain is little to nonexistent. - Wind, Heat and Haze. Nothing much going on on this island for the past few days. It's very hazy today with temperatures around 90degrees. Humidity is at 66% so it feels like it's in the early 100s. Winds are at 10 to 20mph coming from the east. The saharan dust does NOT have a pleasant effect on allergy and sinus sufferers such as myself. Watery and itchy eyes, runny nose, or continuous sinus congestion. Naphcon eye A drops works very well for the eyes. Well I am relieved that Mr Low has dissipated. It's rather windy here, but it's still a bit warm. Temperatures are in the upper 80s. The sky is mostly cloudy with an "eye hurting" glow as the sun forces it's way through. Yesterday, the entire morning was grey with continuous sprinkling showers. The afternoon was pretty much as it is now, windy and cloudy. ... I am with you Gert, I hope that low doesn't upgrade into anything! There's nothing much going on here. I'm not sure if it's just me, but the temperature seems to be rising as the days go by. This place is truly HOTTT!!! I've never seen so many umbrella's in our town, Basseterre. It has nothing to do with rain! It's the sun everyone is hiding from! The place is a bit on the dry side, little showers here and there which evaporates in no time. Right now, at just after 11:00pm, we are having a nice shower. I feel like running outside and getting wet just to cool down from this heat, but for a moment there it sounded like pebbles falling out the sky, so that wouldn't be such a good idea. Yep! It started out extremely hot and humid. Around 12pm, it poured! Rain continued regularly through the entire afternoon with just a few thunder. It has been rather dry, so yes, we are thankful. We are promised more haze, as even more Saharan Dust makes its way towards the islands. A few waves are traveling over the Tropical Atlantic, so let's keep our fingers crossed. Hazy, hot, a bit cloudy and windy, but absolutely beautiful! It's the beginning of our three night music festival events. So far the weather has been holding up pretty well, just a few occasional showers, but nothing much to worry about. 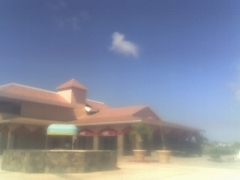 For those of you who would like to see the schedule, go to www.stkittsmusicfestival.com. Attached are some photos taken today at the south eastern peninsula. Note the haze and cloudiness, but enjoy the view! We are in the 2nd, entering into the 3rd official week of Hurricane Season. We keep hearing repetitive "talks" about Hurricane preparedness. We are hearing it, but are we listening? On my way to work, I glanced at some of the houses in a residential area, and was amazed. So many needed repair! Hurricanes have spared us for several years. We are not taking the Hurricane Season as seriously as we ought too. We should all take a trip down memory lane - Hugo 1989, and more recently: Luis, George, Ivan and even backward Lenny. Each one took a different island by surprise. With that in mind, let's do what we can to prepare ourselves. Like the old folks always say, "better to be safe, than sorry". Today has been hazy and dry, with a few clouds lingering around. Temperatures within the mid 80s. Humidity approximately 62%. The past days have been really hot with a few brief showers. Last evening though, there were few heavy showers, with an occasional rumbling of thunder. This morning was somewhat overcast, with little rainfall, but most of that has vanished. The heat should be on for the rest of the day. Eyes are being drawn to the tropical wave a few hundred miles of the cape verde islands. Though this system appears to be decreasing, it is still a warning for us to be prepared for this Hurricane Season. Yesterday was dreadful here. We had an island wide black out which lasted from after 7:00am to around 8:30-9:00pm. For those of us without generators, we had to suffer greatly - This place was HOTTT! Most, if not all the shops on Port Zante's complex had to close down for the day, as there are no generators, hence no light, no AC, nothing. 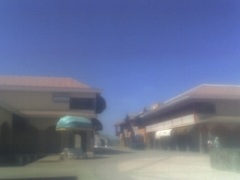 As my coworkers and I sat around on the benches, we enjoyed the cool breeze, and the sunlight blue sky. Some cumulus clouds moved lazily around, but mostly clear blue sky (see the attached photos I was able to take with my cell). Today is sunny with clear blue skies. Temperatures are as high as 86degrees, but trust me it feels like it's in the 90s. No sign of showers. So far the electricity has been perfect. I pray it stays that way. The past nights and days have been hot, and getting hotter each day. To add insult to injury, the electricity has been having quite a few problems, which seem to be common around and during every hurricane season... I'm hoping it's coincidental. We had a few overnight showers, making the morning a bit breezy and cool... but as the sun rose what was left from the rainfall evaporated in no time. Temperatures streamed in the 80s, with just enough breeze to lift a hair :-) Skies blue, with a little haze, and a few puffs of clouds here and there. All in all, it was a great hot day! Have a great evening! Let's pray the electricity stays so I can make use of my fan. - Hurricane Season is upon us! Well I see those hurricanes just couldn't wait for the season to start! We are already at Tropical Storm Barry, who should be affecting the west coast of Florida soon, but don't keep your eyes north. We have lots of squally weather around us. Be prepared! Yes most of us have been spared for several years, but we don't have El Nino on our side this year, and we have been promised a very active season. 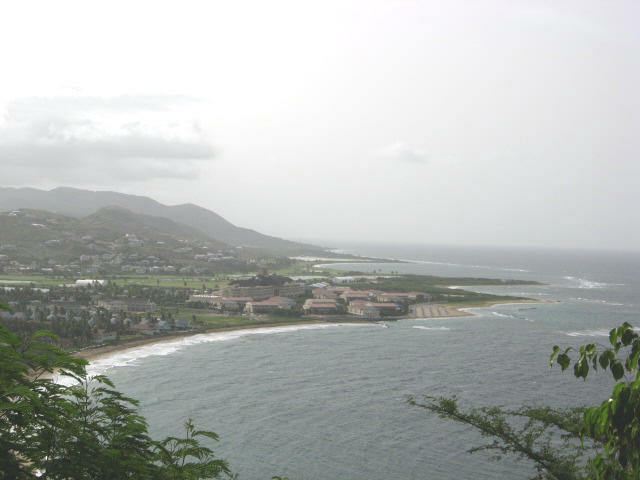 The season started full swing with several downpours last night through mid morning here in St. Kitts. Last night, I was looking forward to a brilliant full moon, but was unable to get a peek of it. The sky has been overcast for most of the day with just a few showers, and barely any wind. The heat was on, temperatures still in the 80s with humidity up to about 79%. Thank God for the rain though, the plants are looking wonderful, but the weeds are getting out of control. To the Caribbean: Good luck to you all. I pray for our safety throughout the season. - Another beautiful day in Sugar City. I trust everyone had a wonderful holiday weekend, and for us kittitians who love to party... a great Green Valley Festival! The weather has done us pretty well, sunshine most of the weekend, and yesterday with just a few occasional light showers. Lovely days for the beach as well, which were packed with locals and tourists alike. 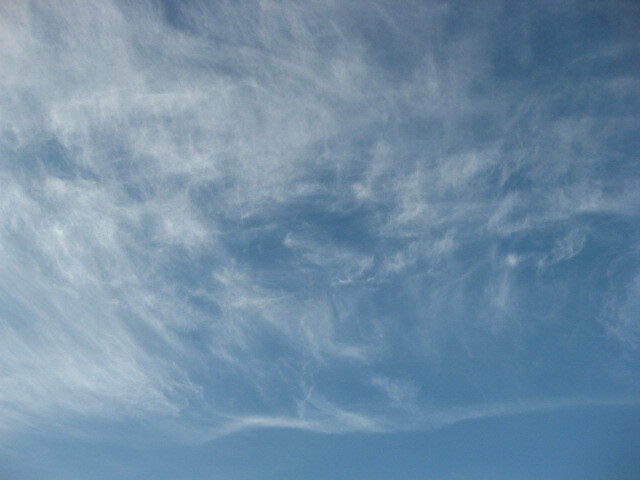 The morning started with beautiful cirrus clouds scattered throughout the sky (see photos attached). As the sun rose, so did the heat - temperatures streaming in the 80s throughout the day, with few clouds and shattered showers. - Oh what a heat! Not at all close to what the forecast had for us today. After the occasional rain, thunder and lightning last night, we awoke to a very still, sunlit morning. Today was extremely hot and humid! A little misty, with just a few clouds here and there. The heat though, was the worst. I tried taking an early afternoon nap, and it was impossible. My poor fan seemed to be blowing out heat. I felt sticky and uncomfortable. There wasn't much of a difference being outside either. The wind was nonexistent, and my skin felt like it was burning off... sunscreen people! Please protect your skin against those rays - at least use a moisturizer with SPF15, and wear shades with UV protection to protect your eyes! Attached is a pic of the peninsula area under a bit of haze. Well this is definitely a change in weather. Just a few days ago, we were all begging for rainfall. I guess we got what we asked for and more. For the past two nights we had quite a bit of rain. This morning though it cleared up, and the sun peeked out it's wondrous head. Most of the day was quite hot - just around mid 80s, with party cloudy skies. Late this afternoon the sky turned awfully grey. We received quite a down pour on and off for the past few hours. Currently it is overcast, with light rain, and occasional thunder/lightning. Temp. is currently around 77degrees, though feeling like early 80s. It should continue raining through tonight, increasing tomorrow with a probability of more thunder/lightning. ... but as you know, the tropical weather tends to be unpredictable, so let's hold tight until tomorrow. First thing this morning, I woke to the sweet smell of a light a.m. shower. The air not as uncomfortably hot as most mornings, just nice and cool. The day was sunny to partly cloudy with just a few showers here and there (it's about time!). Temperatures generally around 86degrees, though it felt like 90. Quite a bit of tourists came out to Port Zante to shop, but I'm pretty sure many enjoyed the beach. Yes, it was another beautiful day in this Paradise! Today has been a much clearer day than we have been experiencing these days. The past week has been extremely hazy. My poor sinuses were in an uproar. The morning started out pretty dull... almost looked like rain, breezy and cool. Then, the sun came up, oh what a Heat! Great day for the beach. Temperature streaming in the 80s (degrees F), but feeling like 90s. No sign of rain... yet. Speaking of rain. I'm sure the question on everyone's mind is "where is the rain?" I took a short drive today, and what used to be lush and green is now brown - trees, lawns, the hills, mostly brown. A small salt pond on the peninsula has just about dried in! What we really need is rain. Well the sun is now setting and the temperature is slowly dropping... let's pray it cools down some so we can all rest well.